I will never be 5’2″. Somedays, I accept that I’m 5’10” and somedays I have a “why me” moment. Why am I not (insert anything) etc? I probably will never have crazy curls, 6″ heels, or be an amazing dancer. But that’s okay. Somedays. This reminds me of a motto that came about during college. Work with yourself. Be Sarah. It’s simple, but I try to remind myself when I see a super tiny amazing dancer. Damn you, Elton John! Work with what you’ve got. I remind myself to be proud that I can sport the skinny jeans, play sports, help elderly/shorter individuals get things down from the taller shelves, AND I can successfully gain (and lose) 10 pounds without most people’s knowledge. This idea can also correlate to home design. I was reminded of this the other day by my spouse. 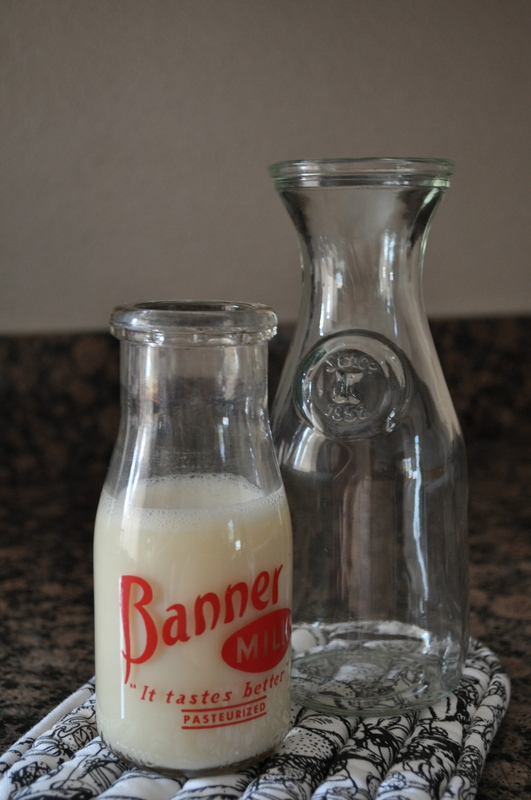 There I was at an estate sale with my husband; I was deliberating between two amazing vintage glass milk jars. Which one do you like best, Paul? I don’t know? Get them both. (pause) Mrs. Contemporary. He’s referring to the fact that I had indeed emphasized a few weeks back the need for my design schemes to be more contemporary. Clean lines. Swanky modern furniture. You know. But my heart and spirit always lead me to an old person’s estate sale! Paul, look at this Pyrex from the 1950’s. I’m in love. I need to work with what I like. I am vintage-y. I like old vintage pieces and add some new, more modern pieces as sprinkles, but rarely as the main ingredient. Work with yourself… in life, your personal style, and home decor. And if you’re wondering, yes, I bought them both. Thank you. That would’ve been a REALLY hard choice. I love them both. And once again, can you please book a good month of your life in the next five year plan to come decorate my future home with me? I tell myself I will never be 5’10” all the time. I share your design aesthetic, I’m curious to see how u will pull it off, it’s a tough combo. Btw, I like the one with the label, makes it more dated.